State Key Laboratory for Disaster Reduction in Civil Engineering, Tongji University, Shanghai. In the east vehicle-free area, there are a lot of tall buildings including the tallest building in Shanghai, Shanghai World Financial Center with a height of 492 meters, the tallest TV tower in Asia with a height of 468 meters, Oriental Pearl Tower, Jin Mao Tower with a height of 420 meters, 88 floors and it is not what it used to be. It was in 1995 that the metro which currently provides eleven lines across the city has been opened to traffic. Since then, twelve lines with a length of 400 km had been opened one after another for only fifteen years. It is planned to be expanded in future. Tonji University located in the north area of Shanghai was established by a German doctor in 1907. It is known for the civil engineering field including urban planning, bridge, road, underground structures among many of universities in China. In 1996, the university merged with Shanghai Institute of Urban Construction and Shanghai Institute of Building Materials. In 2000, the expanded Tongji merged again with Shanghai Railway University. It has been interacted with Germany since the establishment and it can be said that German is an essential language for the faculty members and students. 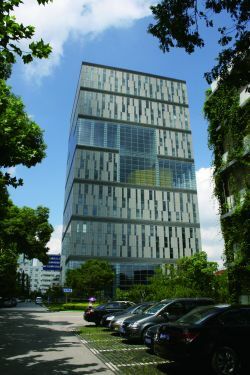 The latest research building with 100m of curtain wall has been completed in 2007 in celebration of the 100th anniversary. Its campus filled with grass, trees, sidewalks, and many parked cars remind one of the typical image in an American university. State Key laboratory for Disaster Reduction in Civil Engineering (SLDRCE), Tongji University, Shanghai use FORUM8's evacuation analysis simulation software "building EXODUS" and virtual reality system "UC-win/Road. 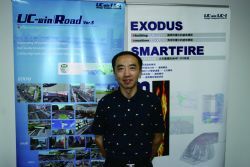 Dr. Han Xin who is the vice director of SLDRCE said "We first adopted building EXODUS in 2006 and UC-win/Road in 2009". "The relationship with Professor Ed. Galea, Greenwich University who developed the software led me to use building EXODUS as he offered to exchange parameters of pedestrians’ flow in the elevator." "Of course, I tried to use different western software such as STEPS and Simulex and some software considers pedestrians’ like a fluid matter. building EXODUS, however, takes into account the detailed interaction and it allows for the representation of people who stop and make a line where the path is becoming narrow and the condition that the moving speed decreases at the stairs and slope." The infrastructure facilities that have rapidly developed include the metro, road, buildings in Shanghai and have a sophisticated design. Its scenery is no less attractive than that of the Western countries and Japan. 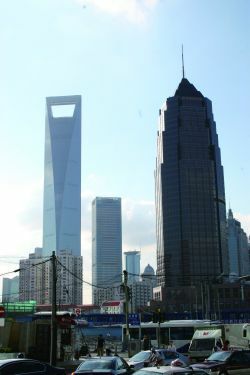 The population of the center in Shanghai is nearing ten million and many people visit for sightseeing purposes. Therefore the entrance and passages in metro have to be designed for a good amount of traffic. "Some infrastructural facilities such as metro and underground road in Shanghai are designed in unprecedented size. The facility design and disaster-prevention measures often cannot be processed using the existing methods." Dr. Han Xin has been involved in the project for improving the underground passage in the people's square station, the metro in the center of Shanghai. 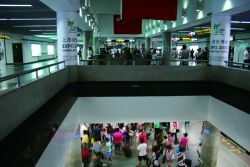 This passage was for one-way to handle heavy amount of people flow, however it was expanded in 2009 for the World Expo, Shanghai and it resulted in the increased convenience in access..
"We have used building EXODUS for these past few years to investigate disaster reduction of underground facilities. Its operation is easy-to use but it requires some experience in the parameter settings. I hope we would be able to set up the parameters while interacting with the software." One of the purposes that we led to our decision to adopt UC-win/Road in 2009 was for creating a clear presentation on the analysis result of building EXODUS to the fire defense department. It has been used for the presentation in virtual reality by modeling the structures such as tunnel and metro. Two dozen researchers are currently using UC-win/Road in his laboratory. In addition, about seventy to eighty staff are using it in the university. "The adoption of building EXODUS and UC-win/Road have changed research methods. Firstly, it allows a variety of parameters such as the number of people and its gender to be analyzed quantitatively while analyzing the crowd movement. Secondly, the condition and people who is in a hurry can be realistically verified by representing the simulation results in building EXODUS. The variables pertaining to height, width; the height and width of people's view can be seen in 3D so that researchers can consider wider perspectives as compared to before." One of the researches of crowd behavior with quantitative parameters is the proportion of people who rides the escalator by walking/staying put. According to his research, it was found that half of people were walking and another half were stopping in Shanghai. The Shanghai data was sent to Professor Galea, Greenwich University to be used for calculation of the number of people transported and for estimation of the queue length for people who are waiting for the escalator.. In fact, more people ride the escalator by staying put in Barcelona, Spain and figures reach 88%. Professor Galea presented that these behavior is based on their nationality with quantitative data in the 2nd International VR Symposium held in Shinagawa, Tokyo, November 19, 2008. There is also a fire experiment facility in SLDRCE to research on burning behavior of buildings in a fire. They also performed joint research activities with Tokyo University of Science. 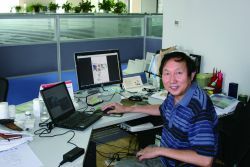 Dr. Han Xin performed an important role as a professional in Shanghai World Expo held for six months, from May to October this year. It was in the news that people were waiting in line for six to eight hours to enter the popular pavilion including Japan and Saudi Arabia. He also researched on this queue in the Shanghai World Expo control center near the site. He said "We performed research on every conceivable thing such as dry mist, drinking service, and air machines". 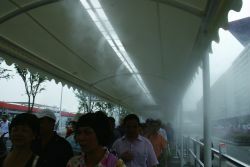 In fact, many dry mist facilities, air machines and facilities for drinking water were distributed without charges and were installed everywhere on the site of World Expo, Shanghai. Small seats are also fixed in the handrail of a zigzag passage for short resting purposes. The facility of World Expo is used for a short period of six months so that we can call it "Temporary". It should be noted that the health and safety of visitors were also considered. The new relationship between FORUM8 and Tongji University was found in the university campus. This was found in the shaking table test with a big shaking table in four meters in length and width, in the civil engineering department with Professor Lu Wen-sheng who specializes in seismic engineering. He has experience in the research project with National Research Institute for Earth Science and Disaster Prevention in Japan and he knows about the largest shaking table in the world, "E-Defense" placed in the Hyogo Seismic Engineering Center in Miki-city, Hyogo well. FORUM8 won the first prize in the blind analysis contest 2009 which was held by this center last year. Keisuke Nakamura at FORUM8 Shanghai who was the translator at the interview explained the system and the judges were very impressed. Nakamura arranged an appointment with him to bring the documents of the FORUM8's analysis in the blind analysis contest and the software, dynamic non-linear analysis software, "UC-win/FRAME(3D)" which was used for this contest. 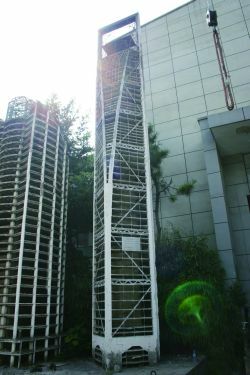 The shaking tests of buildings constructed in China are performed in the facility with shaking table in Tongji University. On the building side with shaking table, there are a lot of tall building models and they seem to be high-rise. It includes the tallest building, Shanghai World Financial Center, Royal Meridien Shanghai Hotel located in the side of People's square station, and the Chinese pavilion of World Expo. In China, universities are one of the most important customers for FORUM8. The strategy of Nakamura in attempting the development of new sales routes through the visit to such institutions as starters showed the dynamism of FORUM8's worldwide development.